It appears I’m the only person who ever thought about holding my bottle of Corona up to the moon. 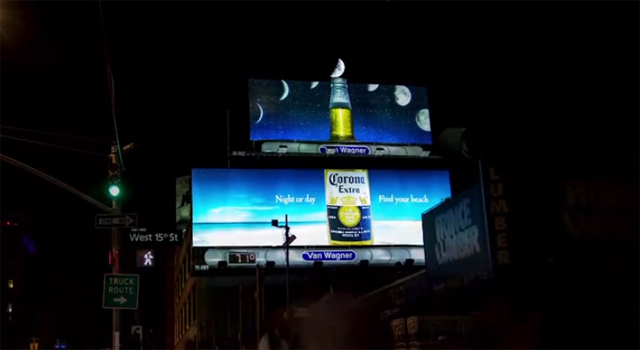 Working with a team of astronomers, ad agency Cramer-Krasselt has created the “Luna Corona’, a billboard located on 15th Street and 9th Avenue in Manhattan, positioned to capture the crescent moon in the mouth of a bottle of Corona. The experience should be viewable from approximately 8:30 p.m. to 11 p.m. ET, assuming clear skies over NYC. 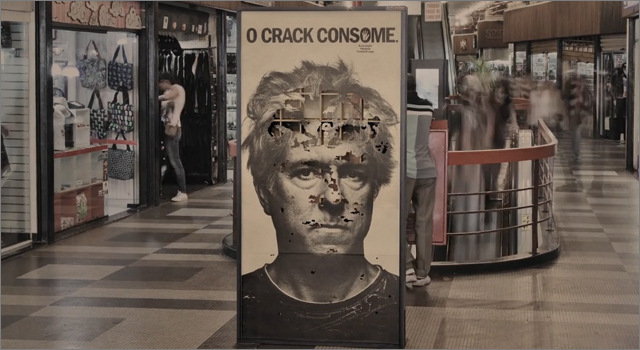 Luna Corona seems like a great idea for a mobile augmented reality campaign. Have Corona fans around the world capture the crescent moon using their smartphone camera, upload it with a #LunaCorona hashtag. Use each image’s GPS coordinates to designate each person’s personal beach (to bring in the campaign messaging). My apologies if this has already done, but there are certainly plenty of worse ideas out there. 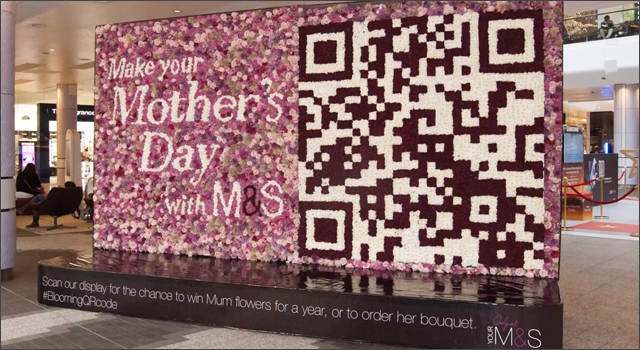 Recently, shoppers at Westfield Shopping Centre in Shepherd’s Bush, West London were given the chance to put their smartphones to a different use. 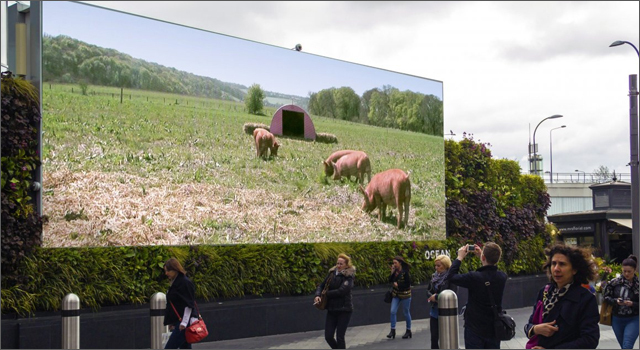 While they watched on a giant digital screen, they could connect to a special URL to activate a feed machine which scattered apples and other feed to a group of free-range pigs at Collings Hanger Farm in nearby Buckinghamshire. The feeding machine, which was created by members of the engineering department at London South Bank University, read information collected from the user’s smartphone’s accelerometer to determine where and how far to scatter the feed. After feeding the pigs, a personalized message of thanks appeared on the screen along with a prompt asking others to make a donation to Compassion in World Farming. 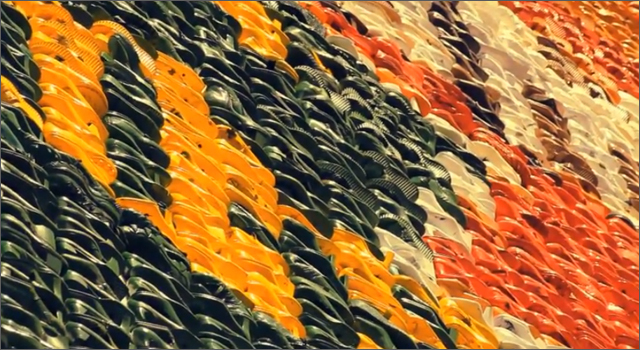 The campaign, created by Elvis Communications, was a winner in Ocean Art of Outdoor competition, in which agencies and brands were invited to come up with ideas that pushed the creative boundaries of outdoor advertising. IBM and the Paris office of ad agency Ogilvy & Mather have created a series of outdoor advertising with an added practical purpose. The colorful ad installations were constructed to include a bench, an overhang to provide shelter from the rain, and a ramp to help people more easily navigate stairs. 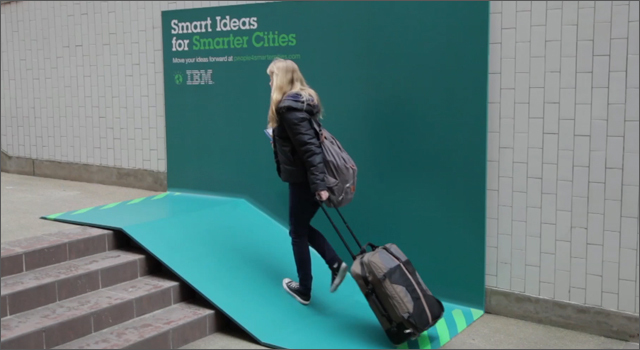 The campaign promotes IBM’s “People for Smarter Cities” initiative, which looks to bring people from around the world together to collaborate on solutions that improve the ways that cities function. 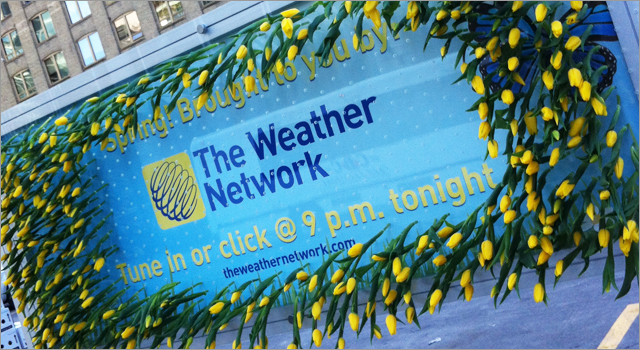 With the wind bringing temperatures down to a biting -12 C in downtown Toronto this morning (Monday, March 4), Canada’s The Weather Network tried to provide a hint of spring with a ‘living billboard’ and giveaway of 10,000 yellow tulips to the bundled-up pedestrians. 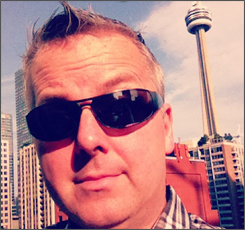 With the ‘official’ launch of Spring still several weeks away, The Weather Network was asking people to tune-in for the broadcast of its Spring Outlook tonight at 9pm EST. 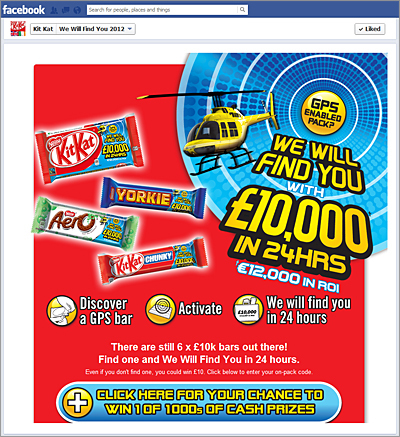 The project was coordinated by PR agency, High Road Communications. You couldn’t blame drivers in LA for slowing down or doing a double-takes as they saw what appeared to be the shadow of a huge dragon against the size of a Sunset Boulevard office tower. 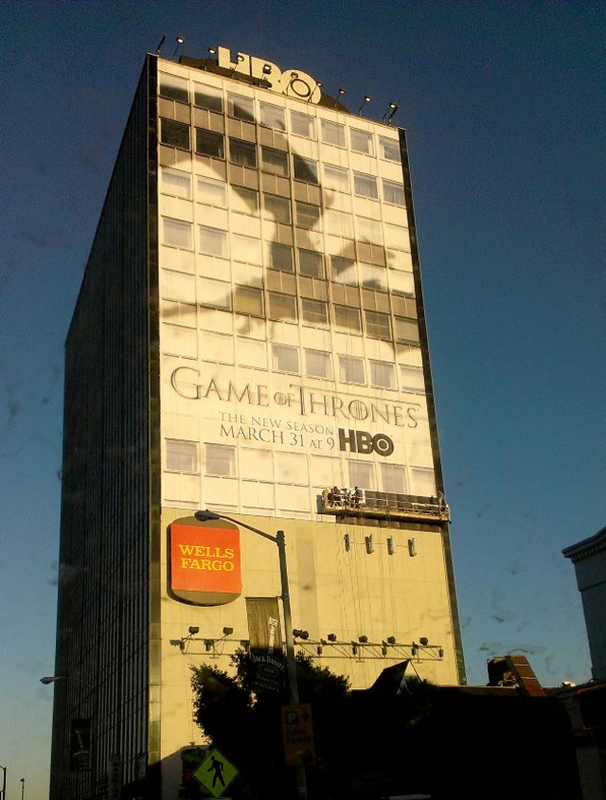 The billboard promotes Season 3 of Game of Thrones which returns to HBO on March 31. 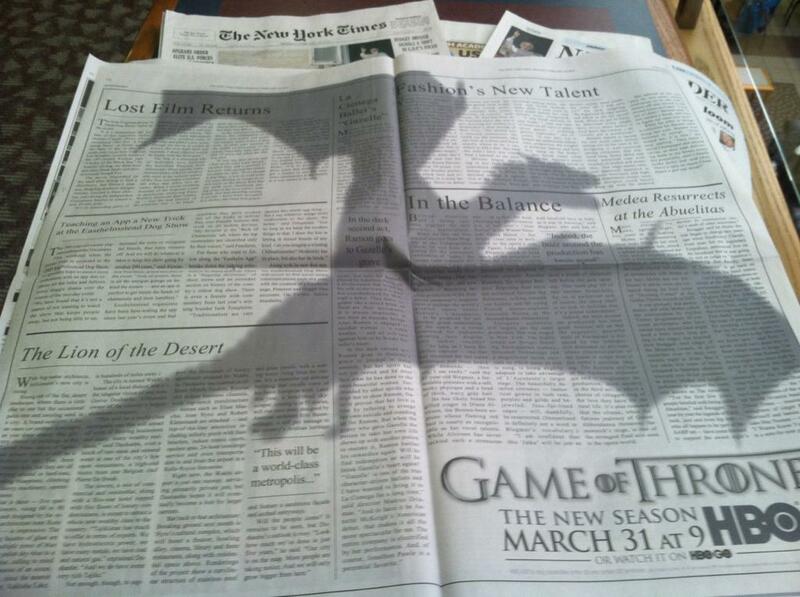 But the dragon sightings aren’t just confined to the west coast, the shadow of one of Daenerys Targaryen’s dragons can also spotted in a NY Times spread earlier this week. A billboard in Lima, Peru serves two important functions. It not only advertises the courses at UTEC, the University of Engineering and Technology, but demonstrates the capabilities of the school’s engineering students by producing purified water from the the air. Lima, home to over 9 million people, is situated on a long stretch of coastal desert where it rarely rains, making access to safe water a challenge for many in the city. 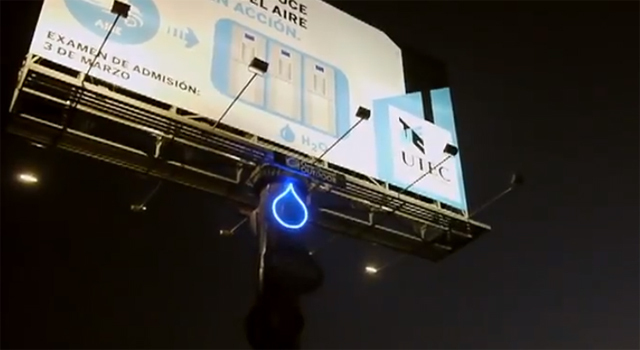 Despite the lack of rain, the high humidity in the air enables the 5 generators contained in the billboard to convert the humid air into water. In just 3 months, the billboard created by UTEC and MayoDraftFCB has produced 9450 litres of water for people in the area.